Environmental studies included in a detailed planning application have led to INEOS' oil and gas exploration and production business concluding that there would be no detrimental impact on the local environment from its second proposed shale gas testing well in Rotherham. Rothbiz reported in August that land to the south of Dinnington Road at Woodsetts is the second Rotherham Greenbelt location for a proposed test drilling operation as it searches for shale gas. 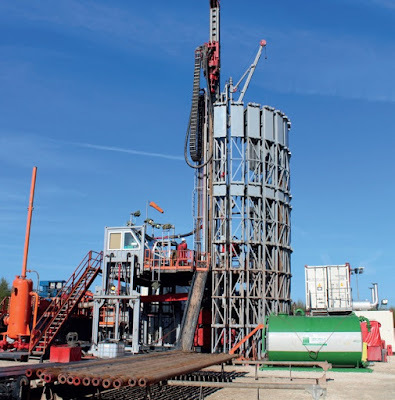 A type of natural gas, shale gas has the potential to become an important energy source for the UK, as it is in the US, but extracting the gas using a method called "fracking" (hydraulic fracturing) has negative environmental impacts. The second site is on agricultural land at Dewidales Wood, close to Woodsetts, Rackford Farm, Anston Stones Wood (a Site of Special Scientific Interest (SSSI)) and Lindrick golf course. If approved, the application would provide temporary permission for a maximum of five years and the operation would involve months of various site investigation surveys and site preparation before a period of drilling, coring and testing. A well would be drilled to approximately 2,800 m using a drill rig of maximum 60 m rig height followed by three months of testing. The site would be restored after the activity has taken place and tests will be carried out on the suitability of the area for hydraulic fracturing. Prepared by Turley on behalf of INEOS Upstream Limited, the plans conclude: "A number of environmental studies have been carried out which support the application and conclude that there would be no detrimental impact on the local environment. The design has evolved to take into account the information and feedback received during the consultation process and mitigation measures have been incorporated into the application where necessary." The studies cover areas such as noise, traffic and transport, ecology, landscape and hydrogeology. A planning application is currently being assessed for INEOS's first exploration site in the borough - at a site between the villages of Harthill and Thorpe Salvin. Rotherham Council has raised concerns over road safety regarding "the introduction of a significant number of additional large commercial vehicles along these narrow country lanes." Traffic analysis shows that both projects are expected to generate 70 total daily movements with 60 HGV movements for a period during site development and establishment and the drilling, coring and pressure transient testing stage. The Woodsetts application states that during construction there would be fewer than ten HGV movements per day for the majority of the time. On up to 40 days there would be more than ten movements per day and for three weeks there would be between 50-60 movements per day (five per hour over a 12 hour period) when aggregate is brought to the site. During drilling there would be fewer than ten daily HGV movements for most of the period, with periods at the beginning and end of drilling stage of between 20 and 42 HGV movements daily (two to four per hour over a 12 hour day). In addition there would be up to 16 movements greater than 32 tonnes at the start and end of the stage as the rig is mobilised and demobilised. A traffic management plan has been drafted showing how the vehicles will travel through Woodsetts village between the drilling site and the A57. It adds that, with mitigation measures, "the changes in traffic volume would not be sufficient to materially alter road safety risk." What about the increase in police vehicles escorting the lorries as seen at PNR and Kirby Misperton and the road closures by the police to facilitate the increased traffic to the site?